Taps sounded every evening at 7 PM in Gettysburg PA.
100 Nights of Taps is open to buglers and trumpeters of all ages. Please choose any date (only one) between Monday May 27 and Monday September 2, 2019 from schedule below. Send an email to GettysburgTaps@gmail.com requesting a date. It is important that you keep us informed of any changes. Please visit that page for updates regarding 100 Nights of Taps. It will be an active page during the summer. Buglers will be expected to report to the Gatehouse located by the entrance to the Cemetery on Baltimore Pike (Rte. 97) by 6:30 PM on the evening they sound Taps and will sound Taps at 7 PM sharp. There will be a representative there to greet each performer. During the summer there might be a special guest who will give a short presentation prior to Taps. 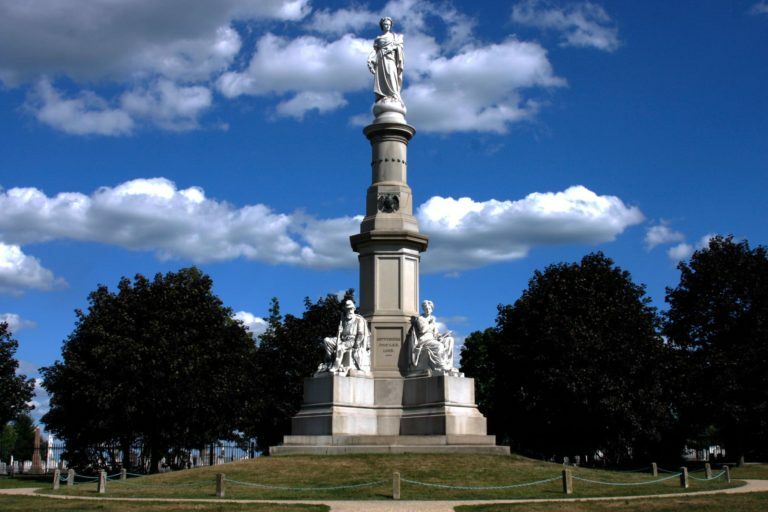 We will also have special ceremonies on Memorial Day May 27, D-Day June 6, Flag Day June 14, Gettysburg Brass Band Festival on June 8, Independence Day July 4, VJ Day August 14 and Labor Day September 2. There will be other special events too. These will be announced on the Facebook Page and Website. This event is rain or shine unless there is severe weather. Taps is a solemn honor to those who have died in service to our country and to those who are serving in uniform today. Please make every effort to perform this call in a dignified manner. Photos and videos are allowed. We will post photos each day. No solicitation allowed unless approved ahead of time. No pets (unless it’s a service animal) are allowed in the cemetery. -Military or Civilian dress (appropriate clothes please) If you wear a military uniform, veteran service organization, band uniform or any outfit representing a group, please wear the uniform in keeping with rules and regulations governing the wear. -Echo Taps will be allowed for this event if you are coming with another bugler. Please let us know ahead of time. 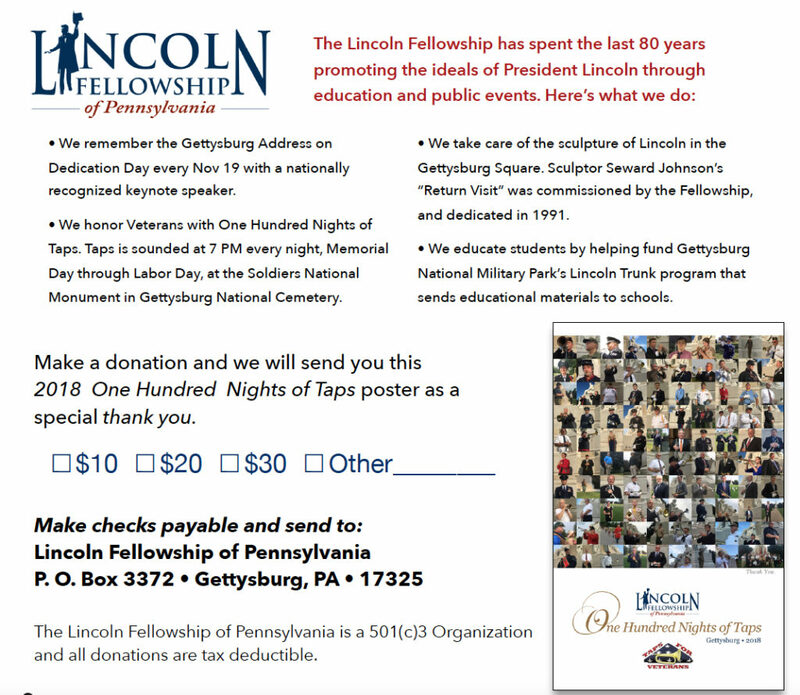 100 NIGHTS OF TAPS GETTYSBURG 2019 is sponsored by The Lincoln Fellowship of Pennsylvania, Taps For Veterans, and The National Park Service. We encourage you to contact your local newspaper, television and other media to promote your performance at the 100 Nights of Taps. Please notify Wendy Allen by email at wallen_123@comcast.net if you are contacted by media so you can get a list of talking points about 100 Nights of Taps, The Lincoln Fellowship of Pennsylvania and Taps For Veterans. Thanks for taking of your time and talent to be part of 100 NIGHTS OF TAPS GETTYSBURG 2019! Monday September 2-All are welcome for our closing ceremony. 100 NIGHTS OF TAPS GETTYSBURG 2018 POSTERS ARE HERE! This entry was posted on Sunday, April 16th, 2017 at 5:27 pm	and is filed under Bugle Stories, Buglers Through History, Bugles for Performing and Collecting, General Interest, Getting Started on the Bugle, History of Taps, History of the Bugle, News, Taps Performance Guidelines. You can follow any responses to this entry through the RSS 2.0 feed. Both comments and pings are currently closed.